The story of P.T. Barnum and his rise from poor family man to a wealthy showman and how he created his now world-famous circus. "The Greatest Showman" is a movie based on real people, but it is a biography only in the loosest sense of the word. It should really be viewed as a fictional musical whose characters happen to share names with real individuals. In all honesty, we doubt anybody went to see this movie looking for a history lesson. We're sure they just wanted flashy lights, memorable songs, and frilly costumes, and who can blame them?! 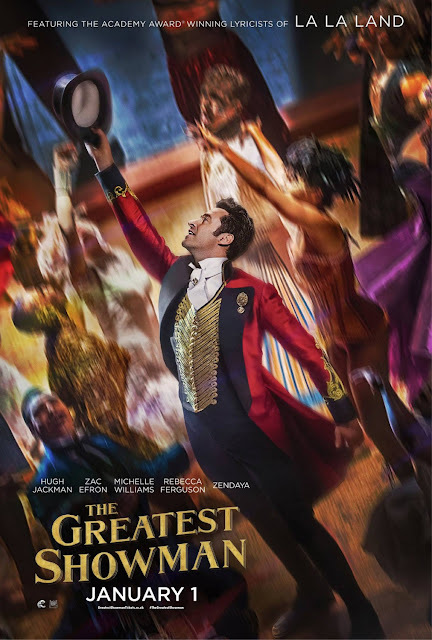 "The Greatest Showman" serves as the directorial debut of Michael Gracey and is written by Jenny Hicks and Bill Condon, who is known for other musicals like "Chicago" and "Dream Girls." The film stars Hugh Jackman as P.T. Barnum, the founder of what would eventually become the Ringling Brothers and Barnum & Bailey Circus. Joining him is Michelle Williams as his wife Charity, Zac Efron as his partner Phillip Carlyle, Rebecca Ferguson as famed singer Jenny Lind, as well as Zendaya, Keala Settle, Sam Humphrey, and Yahya Abdul-Mateen II, who make up the various performers in Barnum's circus. In the film, Barnum grows up poor and struggles to make ends meet as he tries to take care of his family. After being laid off from his bookkeeping job, he decides to open a museum that will put on display all sorts of natural oddities and probably some unnatural ones to boot. What starts as a shrine to dead odd things quickly turns into a lively and raucous daily show featuring music, dance, acrobatics, and many, many different looking people. First and foremost, "The Greatest Showman" is a musical. The number one thing a musical needs to have is good music. Luckily, this film contains some terrific toe-tapping tunes, a couple of exposition-heavy serious songs, and a few heartfelt romantic ditties as well. For the most part, the songs are memorable enough that they will stick with you as you leave the theater. As a story, "The Greatest Showman" forgoes an accurate portrayal of historical proportions in order to tell a more socially relevant, grandiose tale, delivering a message of inclusion and acceptance for all people. Hugh Jackman offers a commanding performance, and with his musical theater background and existing experience in theatrical musicals, he was the perfect choice for the lead role of P.T. Barnum. His charisma shines through each and every moment of the movie and allows the audience to forget for a brief moment that the empire P.T. Barnum built was actually pretty damn terrible. Zac Efron gets a chance to remind everyone who forgot that he once starred in "High School Musical" and is an exceptional singer. He has an excellent, authentic romance with Zendaya, who is also a splendid singer and does well in her role. This is not to say that being a great singer was a requirement to be part of this film as Rebecca Ferguson had all of her singing dubbed by "The Voice" contestant Loren Allred. Though all of these performances are wonderful, the best musical moment comes from Keala Settle's performance of "This is Me," a song about not hiding in the shadows and being proud of who you are. Now, on to the negatives. Despite how enjoyable the music is and despite how great the performances are, the narrative of "The Greatest Showman" is very flimsy. It's clear that it is not a tightly written story as it aims to simply fill time in between musical numbers. Also, even though the movie isn't very long, it does start to drag a bit due to this lack of a real story and an absence of anything but surface-level characters. There's a good chance "The Greatest Showman" will please crowds looking for a few songs to dance to and a couple of flashy outfits to gaze upon for two hours, but it may leave some a little disappointed. It can feel more like a collection of music videos than a more engaging story with deeper meaning.